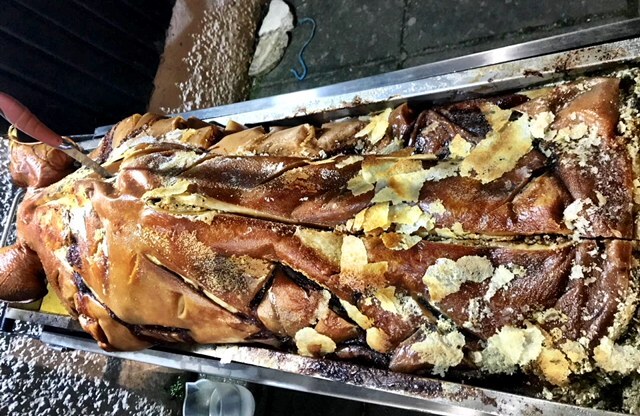 When Hog Roast Normanton caters your special occasion, we prepare, cook and serve fresh, homemade, tasty food so that you can relax together with your guests. It can be stressful hosting a party or event yourself, which is one of the main reasons why hiring a caterer can be a great idea, but with us, you get the whole package. Not only do we provide delicious food, but we also offer impeccable service, and time and time again we’re asked to cater for long-term customers who know this to be true. Plus we even clean away at the end! In terms of the food that we provide, you may be thinking that’s just hog roasts, but you’d be wrong. While our hog roasts are our famous specialities, we also offer so much more, including spit-roasted birds and animals, marinated meats, multi-course menus and also plenty of options to cover special diets. For Mick and Fiona’s engagement party which we catered recently, they asked Hog Roast Normanton for a centre-piece hog roast, which we would carve to make our sumptuous pigs in buns. However, they also needed a vegetarian option for one of their guests, and were very impressed when we told them about the various possibilities. From stuffed vegetables to burgers, and quiches to mac n cheese, our chefs are adept at making all kinds of vegetarian dishes to please all kinds of tastes. For this engagement do, we were asked to make our veggie skewers. With pieces of halloumi and multiple vegetables grilled to perfection, they’re a big hit with our guests and we can even make them vegan if need be, by leaving out the halloumi. On the afternoon of the party, our Hog Roast Normanton chef and assistant made their way to the venue, the gardens of the couple’s apartment building. We were due to serve at 7pm but it would take a few hours to roast the hog. Once the meat had been prepped by our chef, it sizzled away while we kept an eye on it. Later on, while the hog was resting, we got on with preparing the skewers and the ingredients for our pigs in buns, and soon enough it was time to serve.